Complete Kit Includes All You Need To Draw and Paint with Kimberly watercolor Pencils Now! Learn nine techniques using watercolor pencils and easy-to-follow instructions. This watercolor pencil kit supplies everything needed to create six watercolor paintings. The set features six watercolor pencils, an artists� brush, a pencil sharpener, preprinted patterns and a full-color step-by-step book. Perfect for an adult wanting to learn not just watercolor, but drawing too. Perfect without spending a ton to find out if this is for me. What's in a watercolor pencil set? If you are new to the idea of watercolor pencils you should know that you can purchase watercolor pencil guide sets. These sets will teach you the techniques you need so you can create a painting with your watercolor pencils. 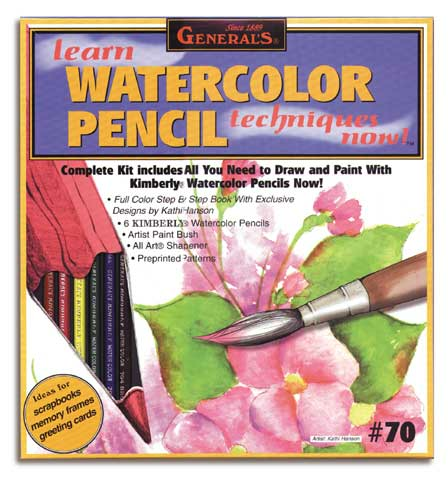 Watercolor pencil sets come with everything you will need to get started painting.